CasinoBonusNews → Casinos → "Casino lasVegas review"
Does it seem fair that an online casino called Casino Las Vegas not only isn’t accepting U.S. players, but continues by advertising slots based on American themes, such as the video slot machine Jazz Club? What U.S. players are missing out on the rest of the world gets to enjoy, since Casino Las Vegas is a strong-running casino that is easily keeping pace with the competition. The folks who run this online casino chose Playtech software to back it, which comes with the security of being tested by Technical Systems Testing and the guarantee of excellent, smooth-running graphics that can only be found by running one of the best software platforms out there. The highlight of the games at this casino is the live casino environment that pairs highly-trained, casino-quality dealers with the ease of signing into a casino through any computer at home. Many people prefer playing live dealer games over the software-dealt versions since they feel the frequency of the cards that come up more closely mimics the way they are dealt in a real-life casino. Some simply enjoy being able to talk to someone rather than hearing the same computerized sounds over and over. Whichever reason you choose, every true gambling fanatic should try out Playtech’s version of a live casino at least once to learn more about this cutting-edge gaming technology. If, however, you wish to stick to the standard way of gambling online, there are more than enough games to cover for you. Dozens of slot machines with eye-catching bonus rounds and progressive jackpots in the millions await those who want to take a risk with a real money account. Then, there are the standard table games that any reasonable online casino should host: Blackjack, roulette, video poker, casino hold’em, Caribbean Stud, Red Dog, and more. Before heading to the tables, though, players should first head to the cashier booth, where they can learn about the current deals and promotions they are eligible for. A staring example is the welcome bonus, where players can earn an extra €400 to use at the games. This begins as a first-time deposit bonus of 100 percent on a maximum deposit of €100, then moves on to three more 100 percent matching bonuses on the next three deposits of up to €100. Players who make their deposits in euros have a playthrough requirement of 20 times the sum of the deposit and bonus, while those who make their deposits in pounds have a playthrough requirement of 25 times. Casino Las Vegas offers a high roller special as well to those who have a little extra cash to burn. The amount of bonus funds you receive is dependent upon how much you deposit. Send in €1,000 to €1,499 and find an extra €300 in your account. Deposit between €1, 500 and €2,999 and get an extra €500. Or, hand over more than €3,000 and you will see and extra €1,000 in bonus funds in your account. You don’t have to be a high roller to cash in, though. 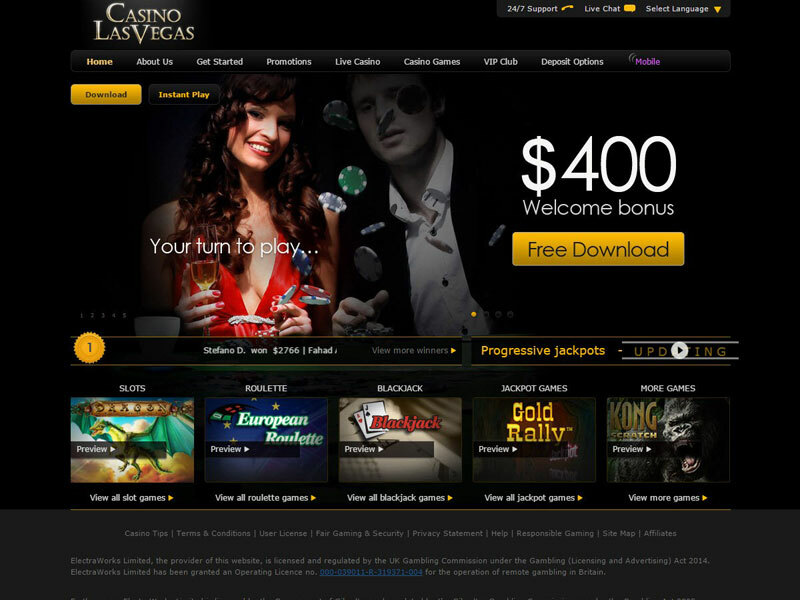 Throughout the month, Casino Las Vegas opens up several reload bonuses for players to claim. It’s best to keep checking back to find out more about which bonuses you are eligible for. There are dozens of ways gamblers can get their cash into a real money account, including credit cards, prepaid cards, e-wallets and direct bank transfers. Casino Las Vegas accepts Skrill, NETeller, Click2Pay, ClickandBuy, WebMoney, InstaDebit, UseMyFunds, Poli, PostePay, Entropay and others for payments to an account. These will usually transfer funds instantly so anyone can be playing within minutes of opening an account. Usually, when a player asks for a withdrawal of funds the money will be returned using the same method he or she used to add funds to begin with, but in those cases where the money cannot be refunded using the same banking method alternatives will be listed. 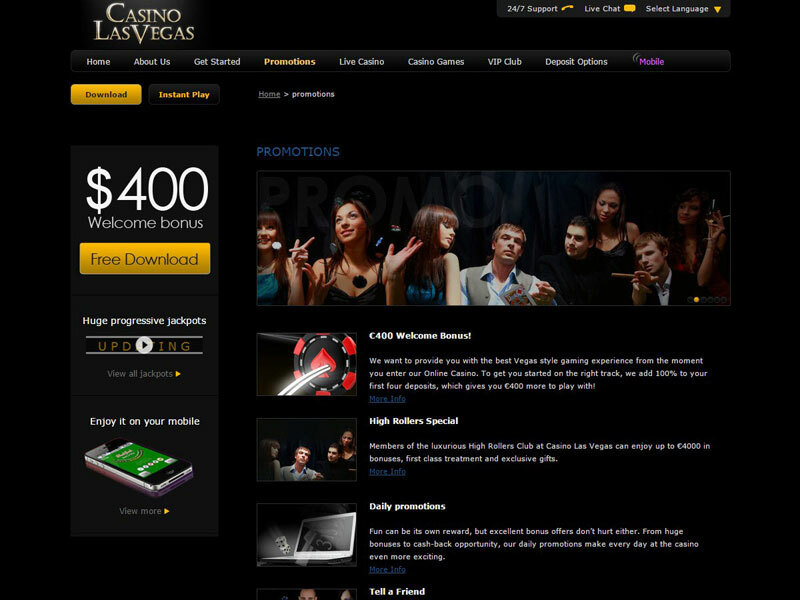 As with the best casinos on the Web, Casino Las Vegas has 24-hour technical support available. Players can choose the live support chat through the site, a telephone consultation or email support.